InstaDOCs is a Documents Server for Office, public institutions, Universities, Hospitals, Hotels, etc. 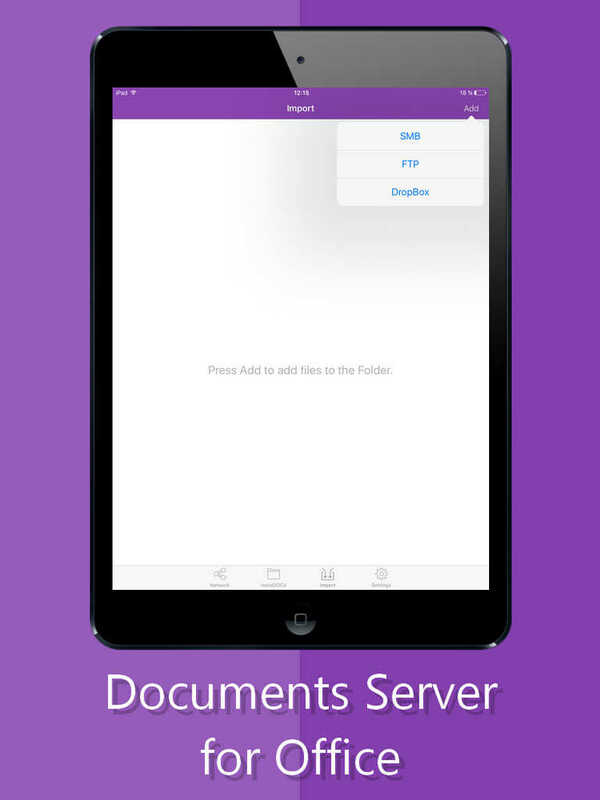 With InstaDOCs you are able to expand the Documents Server on your iPhone\iPad. InstaDOCs will save you from keeping the PC Share Server for public documents. InstaDOCs is a fully automated Mesh server which doesn’t need network settings. Launch InstaDOCs on your iPhone or iPad and, if it’s necessary, set a password, then all documents from your device’s catalogue will be accessible for all your staff and visitors. To download all necessary documents to the working folder of InstaDOCs on the device is possible using the SMB, FTP, DropBox, HTTP protocols, iTunes or from another InstaDOCs server. InstaDOCs also supports VPN Brodcast that allows your staff to exchange documents both on the local and corporative VPN network while connecting to VPN. Within 3 minutes after its launching, InstaDOCs displays the Information Screen, and the application remains active during the necessary time period. If you need the Documents Server for Office to work for a long period of time, connect iPad or iPhone up to the battery charger and don’t close the application. If you close InstaDOCs – the Documents Server for Office, all documents will be available on the network for another 15 minutes. Several independent services can simultaneously work on the network. The application is optimized for working on the network and devices with limited resources, such as iPod Touch 5. 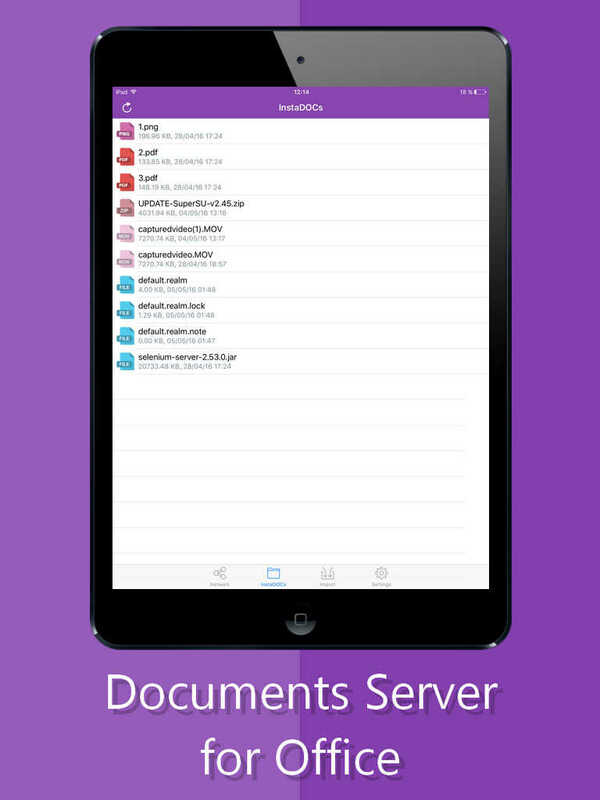 - Documents Server in educational and medical institutions. InstaDOCs service includes free customer InstaDOCs - Client (used by staff or visitors to obtain documents) and InstaDOCs - Documents Server for Office (used by administrators to manage documents). All you need to get the Documents Server on your network is to download the necessary documents to the device, and, if you want, set a password to access to documents. 2) Import documents from Photo Gallery or Documents Gallery. 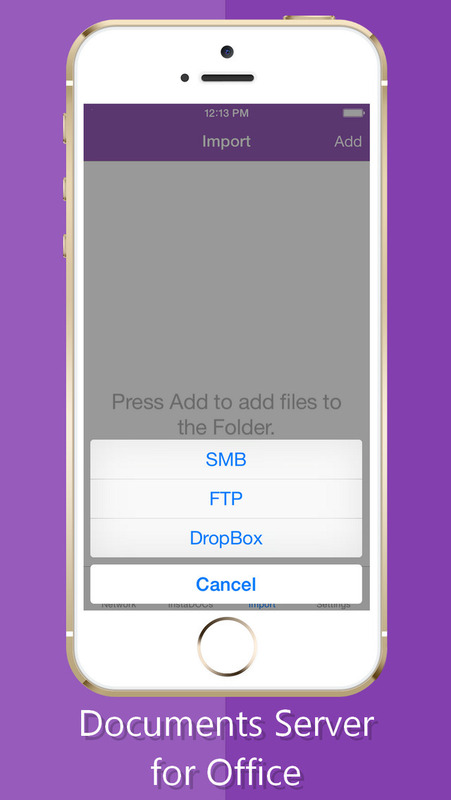 3) Download documents from the server using FTP or SMB protocol, DropBox, iCloud. - All documents from the repository can be promptly reviewed. - As soon as the documents are placed in the repository, they will be available for downloading and viewing for all network InstaDOCs Service’s customers. - InstaDOCs – the Documents Server for Office additionally includes InstaDOCs - Client. With this built-in Client you have the possibility to download documents from another InstaDOCs server. All documents are stored in the client’s repository of documents. 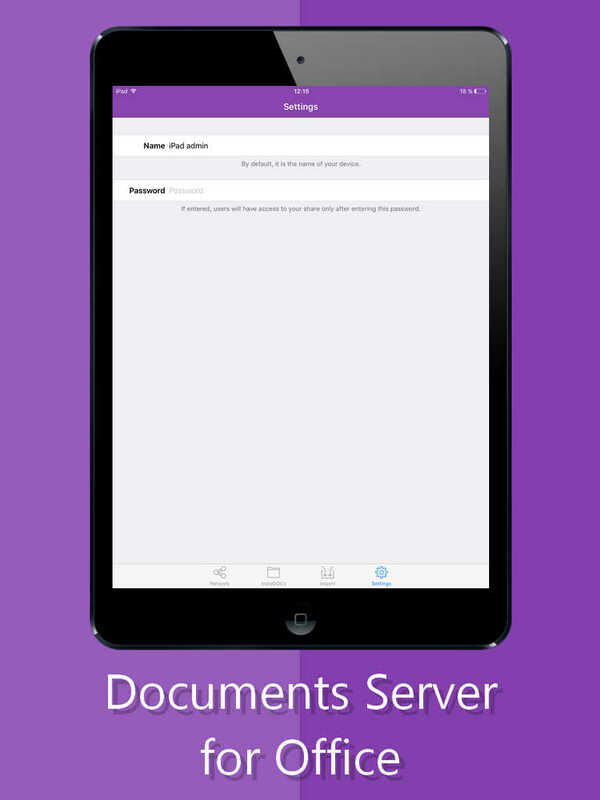 - To view or download documents is possible with using free InstaDOCs - Client, which can be downloaded from the AppStore. - Direct links to download InstaDOCs - Client can be got by going in the Safari browser to the device on which the InstaDOCs - Document Server for Office is installed. IP address of the device is displayed in Settings or on the main screen of the device. To increase the speed of documents transmissions enable WMM mode and Default Forward on Wi-Fi router.